Philadelphia/New Haven: Philadelphia Museum of Art in Association with Yale University Press , 2009. cloth, hard cover in dust jacket. large and heavy book., no flaws or wear. clean, no text or exterior markings. no tears, chips, clips or bumps. tight binding, hinges. ; xiii-585pp., 483 color illustrations and 85 in b/w. 19 essays by 17 contributors. catalogue and reference material. 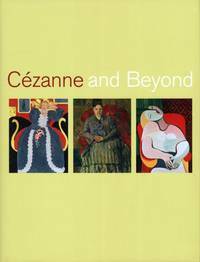 documents the relationship with cezanne and numerous 20th century artists. very well illustrated. . First Edition. Hard Cover. Near Fine Plus/Near Fine Plus. Folio - over 12" - 15" tall. Exhibition Catalogue. Keywords: Cezanne. ; Paul Cezanne. ; Cezanne's Influence. ; Cezanne and 20th Century Art.